Soko Ebisawa Tea ceremony classroom is open. with books chosen by Seigo Matsuoka? 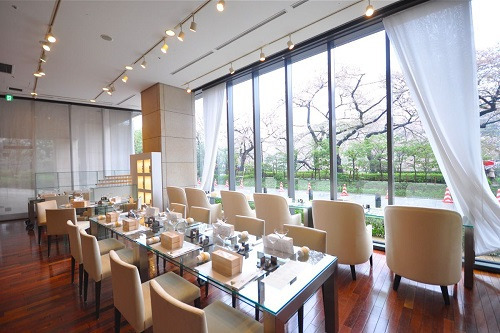 Discover Japanese calender, study tea ceremony, the elegant life. 10:30 a.m. 〜 12:30 p.m. Seasonal Japanese sweets and matcha green tea will accompany each class. "The history of the establishment of Wabi-cha tea making"
I have summarized the complicated and difficult to understand history and spirituality of the tea ceremony concisely so that it can be easily understood. "How to make matcha green tea at home"
The cultivation and manufacturing of matcha green tea, and how to enjoy tea ceremony and hospitality in your own home will be explained. 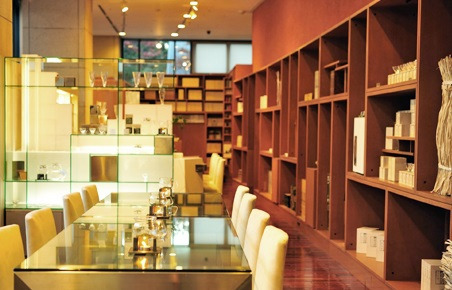 Your fears about not knowing what to do in the tea ceremony will be relieved. "The four seasons as seen in traditional Japanese sweets"
I will talk about the Japanese sense of beauty and expression methods linked to the seasons. 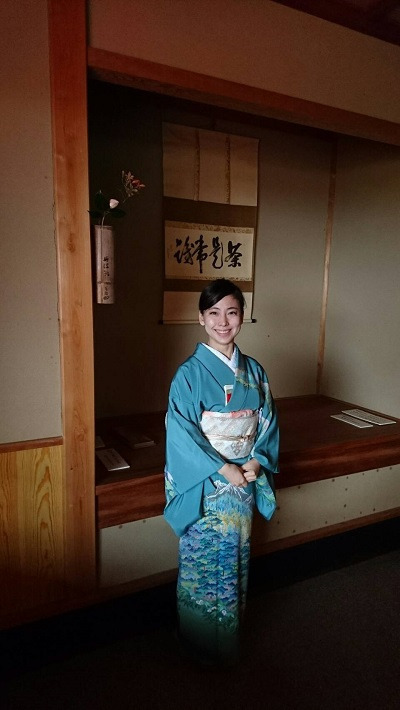 1:30 p.m. 〜 3:30 p.m.
As well as studying the Saijiki seasonal words chronicle, the culture of Japanese Waka poems and fostering the spirit of tea, which will be useful month to month, you will acquire an understanding of the tea ceremony and its graceful gestures. 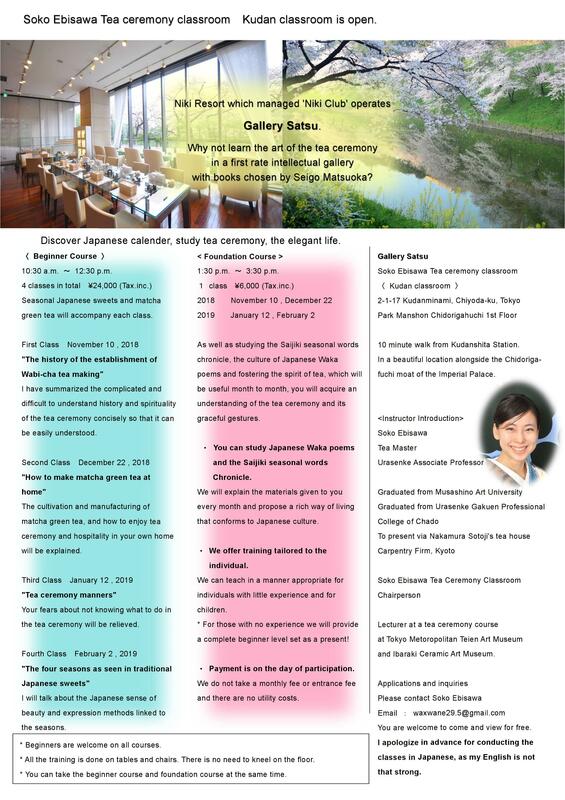 ・ You can study Japanese Waka poems and the Saijiki seasonal words Chronicle. We will explain the materials given to you every month and propose a rich way of living that conforms to Japanese culture. ・ We offer training tailored to the individual. We can teach in a manner appropriate for individuals with little experience and for children. * For those with no experience we will provide a complete beginner level set as a present! ・ Payment is on the day of participation. We do not take a monthly fee or entrance fee and there are no utility costs. * Beginners are welcome on all courses. * All the training is done on tables and chairs. There is no need to kneel on the floor. * You can take the beginner course and foundation course at the same time. 10 minute walk from Kudanshita Station. 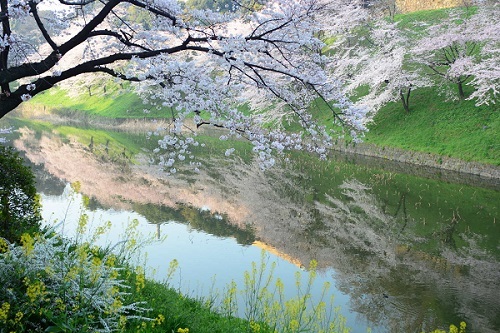 In a beautiful location alongside the Chidoriga-fuchi moat of the Imperial Palace. and Ibaraki Ceramic Art Museum. You are welcome to come and view for free.